Lori and I had a really nice Saturday a few weekends ago, unusual in that we had nothing on the calendar. Actually, quite relaxing in that way, after having had booked weekends for the past month. So we decided to head to a matinee (My Old Lady, very good film with Kevin Kline, Maggie Smith and Kristen Scott Thomas), go grocery shopping and come home and cook together. A week prior, when I was in Ottawa on business, I had gone to a fish restaurant for lunch, and had a delicious “Traditional Spanish Basque Fish Stew.” When I asked for the recipe, which apparently is the signature dish for this restaurant, they gave me a list of ingredients (no quantities) and very incomplete instructions. So it was time for Lori and I to try to recreate this recipe, from the Kanata Seafood Grill (Lapointe Fish Ltd.). 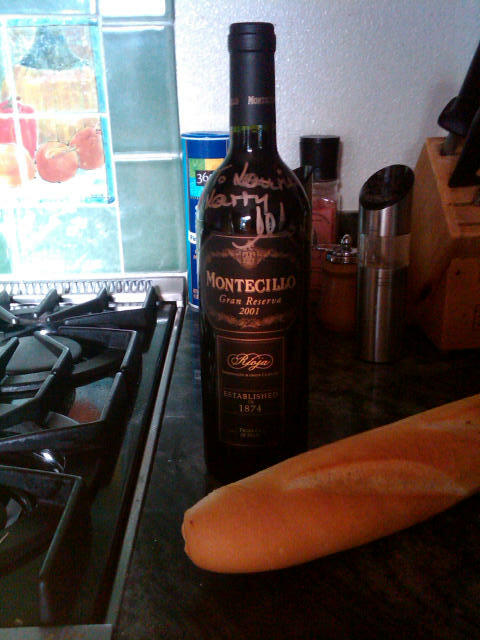 The Bodegas Montecillo 2001 Gran Reserva Rioja, signed by the winemaker, with sourdough baguette, as we’re getting ready to start cooking. 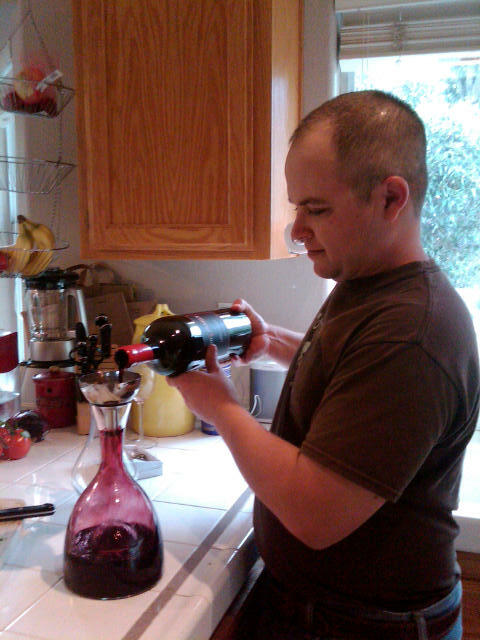 The first thing to do was to open a bottle of wine. A number of years ago we were invited to a tasting in San Francisco put on by Bodegas Montecillo, a winery from the Rioja Alta region in Spain. Great event, with the Bodegas Montecillo winemaker, María Martinez-Sierra, and we learned a lot – well, a lot more than we knew before – about Rioja. We came away from the tasting with a couple of bottles, including the last one left which was a Bodegas Montecillo 2001 Gran Reserva, Rioja. (Signed by the winemaker, as you might notice from the photo above.) Red wines from the Rioja region are made with the Tempranillo grape, however, this was nothing like the Tempranillo wines made in California. First, the soil and growing conditions are significantly different in Rioja than California. Second, it’s the primary varietal there, and not an afterthought as in California. Bodegas Montecillo started using Bordeaux winemaking techniques over 100 years ago, and it shows. This was a refined wine that even after decanting needed at least 30 minutes to open up and be drinkable. And then, it was really drinkable! 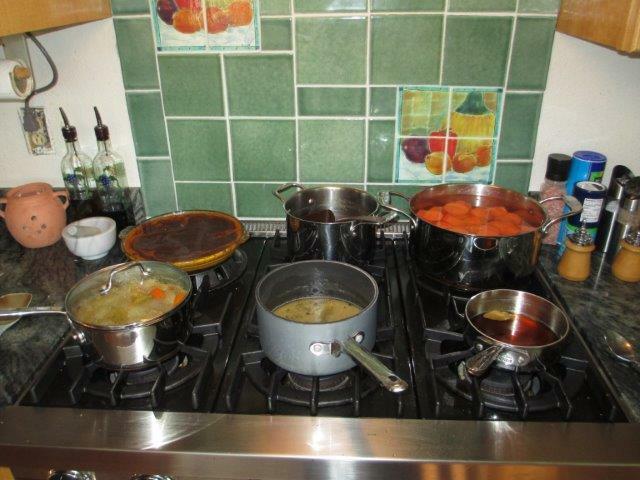 The second thing to do was to cook the fish stew, but with some changes. For example, what was bottled chili paste in their recipe became a jalapeno pepper in our rendition. Tomato sauce became diced tomatoes. Red onion became yellow onion. (A good rule of thumb is that is the onion is to be served raw, use red onion, otherwise go with yellow onion.) There was a zucchini in our refrigerator, so that was added to the stew. Instead of serving it with a French baguette, we went with California sourdough baguette. And we recorded the quantities and techniques used for cooking the stew, and wrote the recipe, which you’ll find on the ViciVino.com recipe page. I hesitate to call this a “traditional” dish, or “Basque”. We’ll leave it as Spanish Fish Stew, and it was delicious. You might think that a big red wine like the Rioja is a bit much for a fish dish, however, the point of the fish stew is not the fish, but the tomato-based stew. The Rioja was great with this stew; a Spanish wine for the Spanish Fish Stew. This entry was posted in wine-food pairing and tagged Bodegas Montecillo, fish stew, Rioja, Spanish wine on November 15, 2014 by vvblogman. 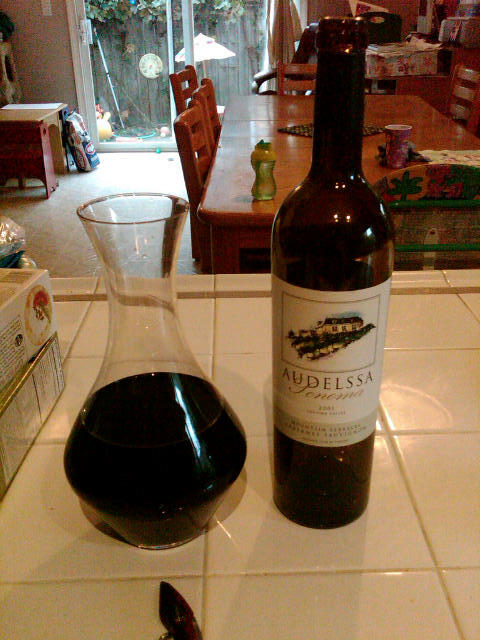 The Audelssa 2001 Cabernet Sauvignon in the decanter, about an hour before dinner. I wish I could remember the story behind us acquiring the Audelssa Cab, but my memory isn’t that good, and neither is my discipline at keeping notes on wines. The Aver Blessings I remember well. We were at a PS I Love You – Dark & Delicious event in 2010 at Rock Wall Wine Company in Alameda. PS I Love You is the Petite Sirah industry advocacy organization, and Dark & Delicious is a great event showing off different wineries and interesting food pairings, all around Petite Sirah. 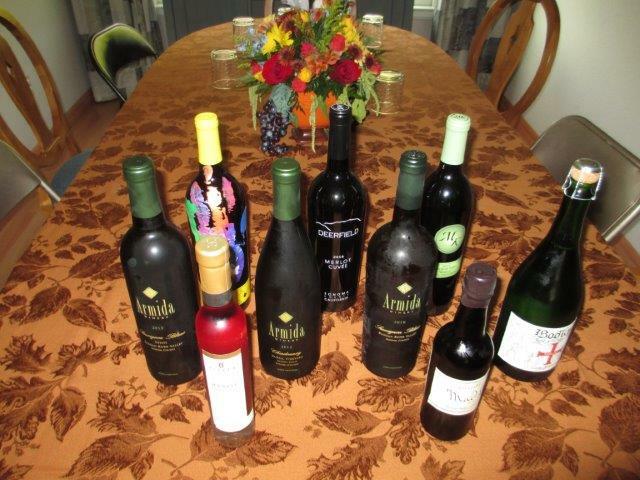 We had recently visited the Aver tasting room in the Gilroy area, and enjoyed their Petite Sirah. Then they were at the event, and a magnum of the 2007 Blessings was part of the silent auction that night. Mine, mine, mine! I can’t remember what we paid for it, but I considered it a great deal (steal!). How many dinners do you have where it makes sense to open a magnum? Well, it made sense that night, as we had enough people to drink it and very good food (barbequed hamburgers, maybe not as elegant as for the usual 85th birthday celebration, but very good nonetheless) to pair with it. I’m not a huge fan a Petite Sirah – that’s more Lori’s – but this was even better than we remembered it. Sometimes Petite Sirah is made to just emphasize how big and bold and tannic it can be. But bigger is not always better, and a bit of restraint with this wine allowed the grape, and the wine, to really shine. Nothing against the Audelssa Cab, which was actually a very good Cab and also went well with the meal, but this night was PS I Love You. This entry was posted in wine-food pairing and tagged Audelssa, Aver Family Vineyards, Dark & Delicious, magnum, Petite Sirah, PS I Love You on November 3, 2014 by vvblogman.